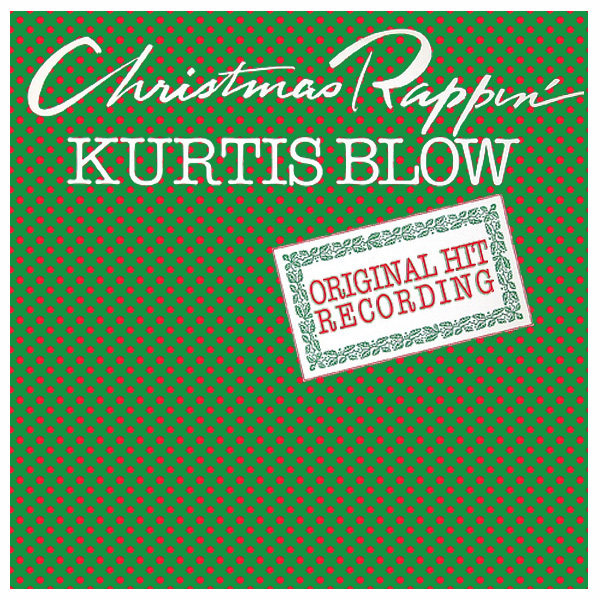 Can you believe that Kurtis Blow released this single in 1979. It is said by some people to be the first rap song ever released on a major record label. Whatever the true story, Christmas Rappin' is one of those songs that is always on the radio through the Holiday season. The cover for Mr Blow's single is, on the other hand, something that you would not want to see every season. First of all, it's a bit boring. But most of all, the bright red spots on the dull green background is, if you stare at it long enough, enough to make you go mad. Whether this was intentional is unknown. Perhaps it was meant to look like holly berries on a holly tree, but it doesn't. It looks like a sanity test from a mental asylum. Stare at it for a while, then close your eyes. Now, isn't that better? The main thing missing from the cover of Mr Blow's single is anything that needs wrapping or indeed unwrapping. To the psychedelic red-spots-on-a-green-background effect has been added a picture of a young lady who, it seems, is in the process of being unwrapped. How can you tell she is being unwrapped and not wrapped? In reality it is difficult, however the extent to which the wrapping paper is ripped suggests that it has been removed in an incoherent fashion, perhaps too quickly, suggesting that the person doing the unwrapping was over keen to get to the present that awaited underneath the paper. Christmas rappin' or Christmas rippin'? You decide.